Do your kids have lots of extra energy? Are you looking for a few easy activities for active playtime fun?? 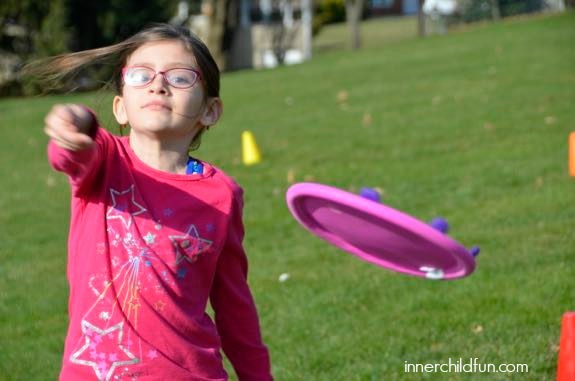 These flying disc games are quick and easy to set up, and most can be played right in your own backyard or a local park. Yay for fun, active, outdoor activities!! A big thank you to our friends at Melissa & Doug for sponsoring today’s creative play ideas! Place cones in a series throughout the yard. Players take turns through the series of cones to try to hit each cone with their flying disc. We love the flying discs from Melissa & Doug because they are well-made and easy to throw and catch! Record the number of tries for each player. The player who uses the least number of throws wins! Set up paper cups on an outdoor table or other flat surface to form a pyramid. Players take turns to try to knock down as many cups as they can. The player with the highest number of knocked down cups wins! Draw lily pads with sidewalk chalk and write a number inside each one (ie. 5, 10, 20). Each player takes a turn trying to land the flying disc on a lily pad. The player with the most points wins! Count how many times you and a partner can toss a flying disc back and forth to each other. For an added challenge, take one step back each turn. The Trixie Flying Disc from Melissa & Doug works really well for this! Use masking tape to form a tic-tac-toe grid on the shower curtain liner. Place the grid on the ground. Players take turns throwing their flying discs to play tic-tac-toe. The first player to land three in a row on the grid wins! Players take turns to see who can throw their flying disc the furthest. The player with the flying disc that lands the furthest away, wins! Optional – For an added challenge, have players throw their discs while standing on their knees.